Things I am currently excited about. . . . .
1.This peanut and all of the new things he is doing and learning. It is so fun to watch him get excited about the littlest things (seeing himself in the mirror, a spatula, touching the leaves on a plant, the thermostat, etc.) and being able to interact with him more. I am really not missing the newborn days. 2. Fall (for the most part)–I honestly love fall, I really do. I love the crispness of the air, the smells of fall, the colors changing on the leaves, fall foods, and the list goes on. 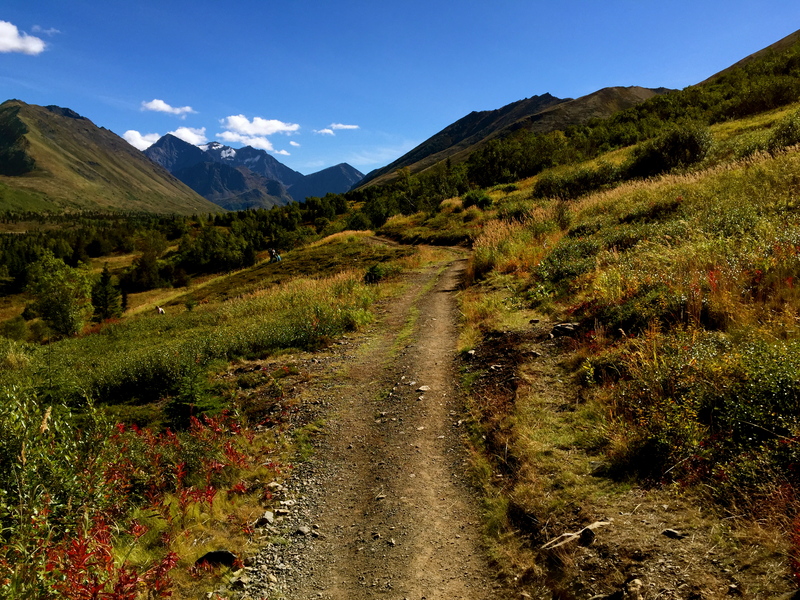 The things I don’t love about fall in Alaska: it comes too early and doesn’t last long enough. Plus fall also means my least favorite season is right around the corner. . . .we just won’t even go there. 3. This sweater from H&M I scored for $25. I am always needing more long sleeve shirts in my wardrobe. 4. Getting back into training! I have taken the last two weeks off from training and running, and it has been much needed. BUT PRs don’t come by me sitting around, so it is now time to get back to work. Monday it starts! 5. Raven Run Club training Saturday morning. 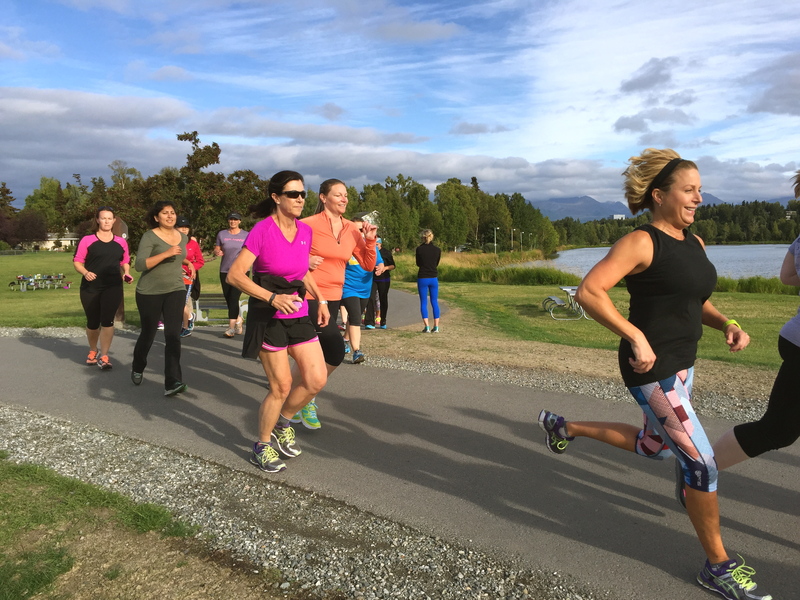 I am loving working with the men and women in each of the training groups we offer through Skinny Raven. I am so encouraged to see people of a wide range of abilities working hard to improve their fitness and stay in shape. Saturday mornings are our long runs and some people walk most of it while others run the whole way. 6. Nordstrom Rack opening September 3 in Anchorage! H&M, Lululemon, and Bath & Body Works all opened this summer. . . .yeah for some decent stores now! I think I’ll wait a week or so to check out Nordstrom Rack until things die down a bit. 7. 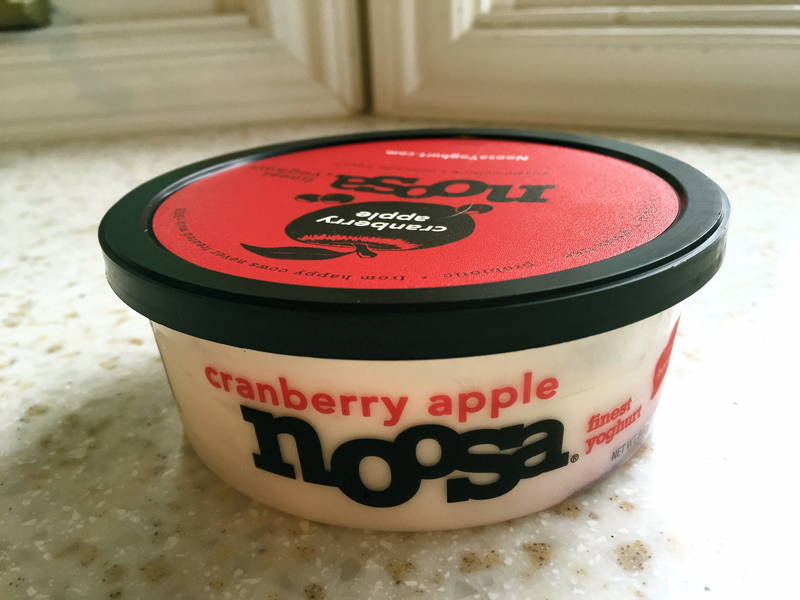 I’ve raved about this yogurt before, and I continue to love it. I also love this new flavor for the fall! And if you haven’t tried the pumpkin flavor, you must–it honestly tastes like pumpkin pie! 8. Labor Day weekend–Craig, Cullen, and I will actually be able to spend a couple of days together! (I usually end up working most weekends.) I’m hoping we will be able to go camping and do some exploring. 9. We have been so busy this summer I am finally getting in some hikes, which has been a lot of fun. On Tuesday, I met a friend and we hiked part of Baldy in Eagle River. 10. 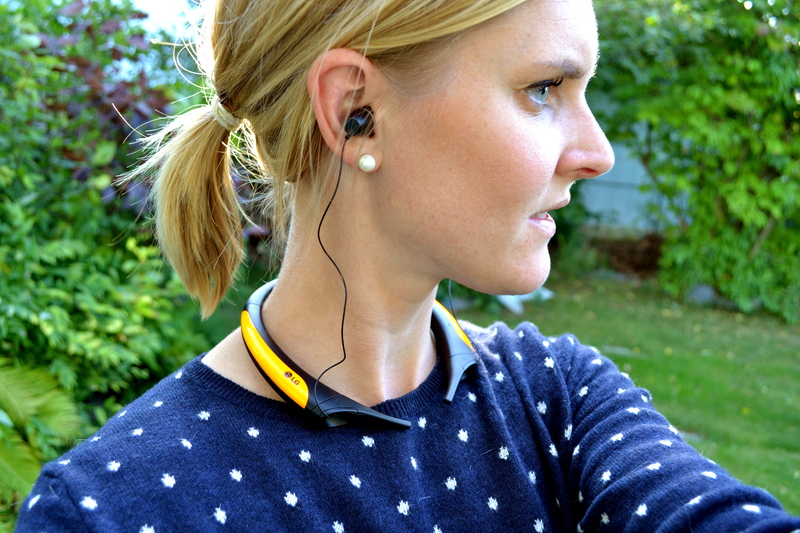 These LG Tones Active headphones. 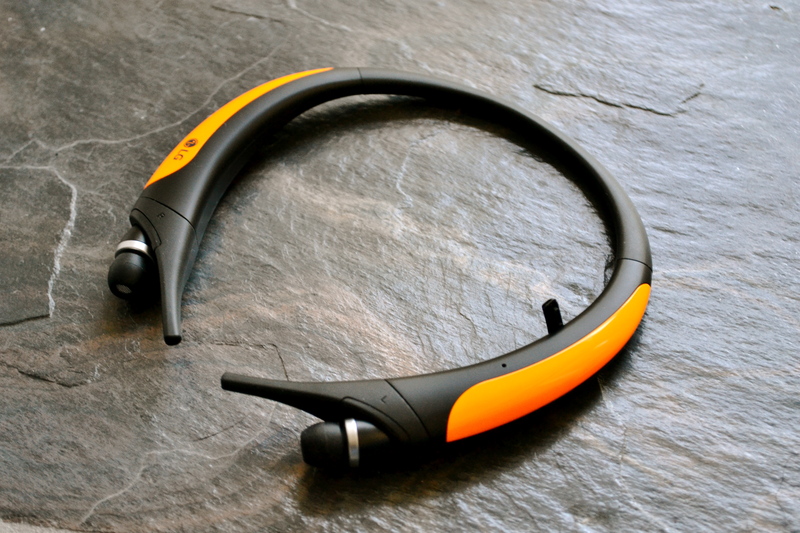 I have never owned a pair of wireless headphones until I received these Bluetooth fitness headphones from AT&T to try out. They worked awesome when I went running. (Don’t mind my casual clothes, I just needed some pictures of me wearing them as I forgot to snap a few pictures after running with them.) The band didn’t jostle around, the sound quality was awesome, and the battery life lasted nearly 3 weeks with daily use. Craig has been using them a lot on his walks and runs too. He likes that he doesn’t have to worry about cords getting wrapped around his arms or caught on other various things. He said they are his go-to headphones right now. I think it’s pretty awesome how the cords retract into the headset so nicely. 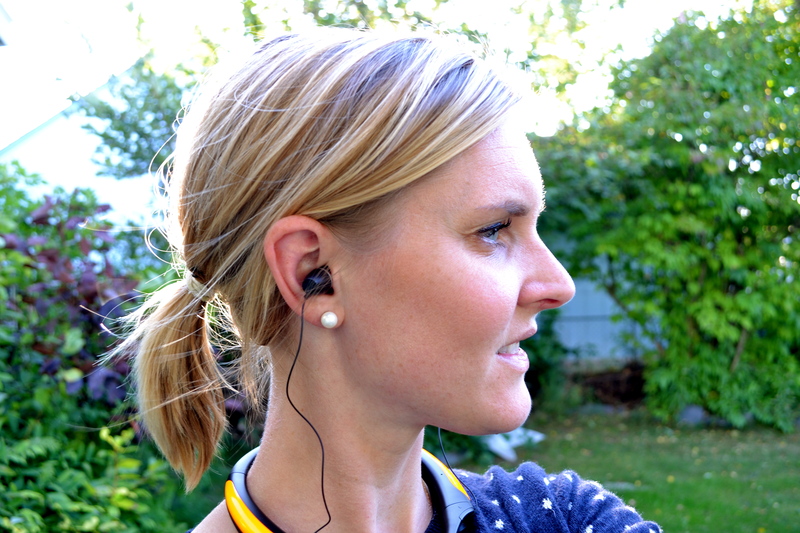 Bottom line: I would definitely recommend these LG Tone Active Bluetooth fitness headphones to a friend. 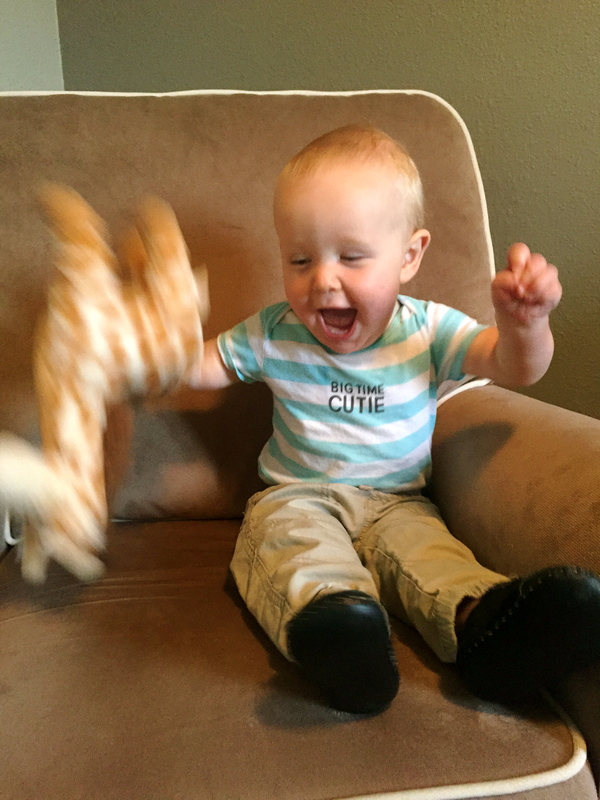 The days are never dull with this little guy! I can tell he’s going to keep me laughing, that’s for sure. While our days are very different, this at least gives you a general idea. 10:00 p.m. The little rascal finally goes down for the night. We were in a good routine when we got back from vacation–going to bed around 7:00/7:30, but for the last several nights he hasn’t gone down before 9:30/10:00. 2:15 a.m. Cullen wakes up. Sometimes his first wake-up won’t be until 6 hours after he’s gone to bed, but more often than not he wakes up every 4 hours. I’ve tried to let him cry it out, but it never works. He actually eats, so it seems like he is legitimately hungry. 4:30 a.m. Cullen wakes up again. We’re still at two wake-ups most nights. I feed him again and he goes back to sleep, no problem. 7:20 a.m. No matter what time Cullen goes to bed, he always wakes up right around 7:30 a.m. Cullen eats again, we hang out for a bit, change his diaper, and then head downstairs for breakfast. I have been taking advantage of sleeping in and enjoying my mornings off from running. I’m not sure how much longer they will last, but I will enjoy it for the time being. 7:50 a.m. Breakfast time. Cullen has banana slices, Cherrios, and a date. 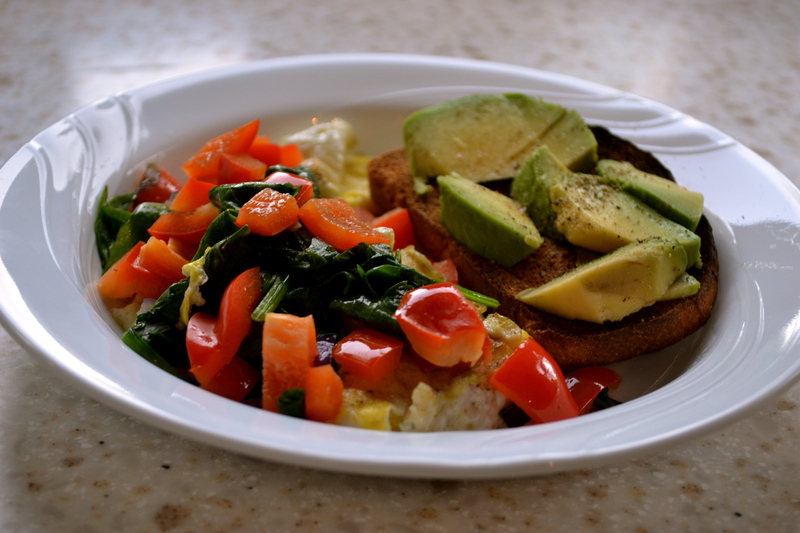 I make myself two scrambled eggs with veggies along with a slice of toast with avocado on it. 8:30 a.m. Craig goes to work, and we head back upstairs to get changed into non-pajama clothes. 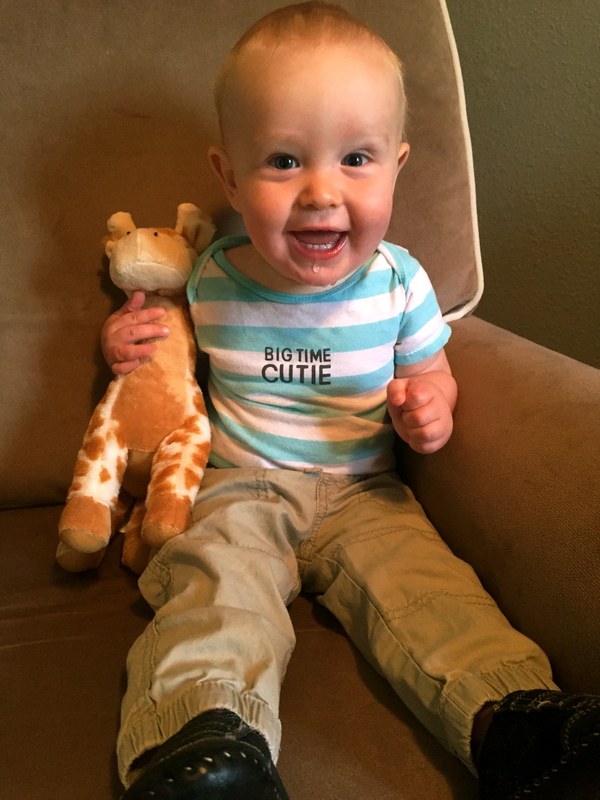 I take Cullen’s 10 month picture. 9:10 a.m. Cullen starts rubbing his eyes, so I take him into his room, draw the curtains, close his door, and read a couple of books to him in order to wind him down. He is almost asleep, but then of course wakes up as soon as I go to put him in his crib. 9:35 a.m. We play, and I pick up our bedrooms. 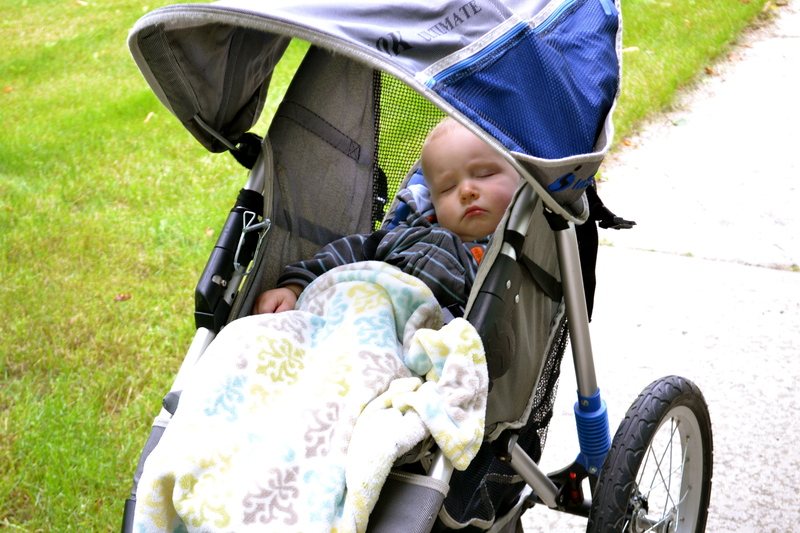 10:35 a.m. Attempt #3–the stroller. Success! Sleep didn’t overcome him right away. It was only in the last few minutes of our 20 minute walk that he finally fell asleep. 11:05 a.m. We return home. 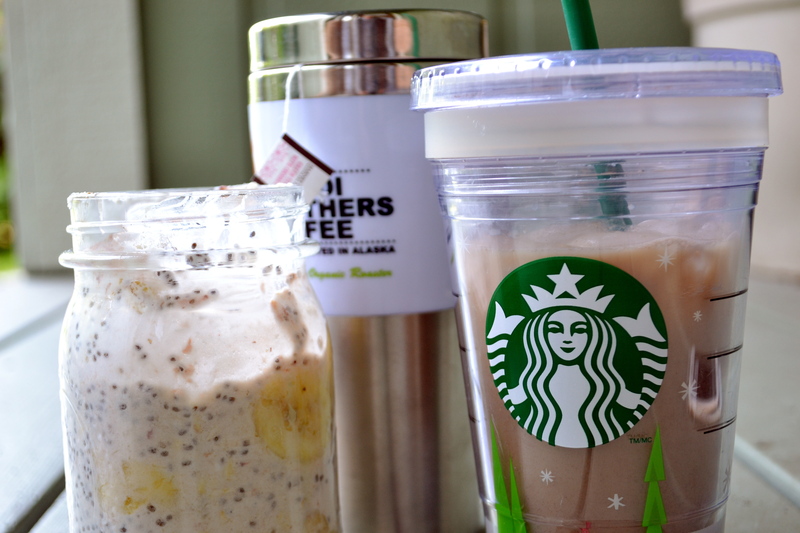 I decide I don’t even want to take the risk of waking him up by bringing the stroller into the house, so I sit outside with him, working on the computer and eating my overnight oats, while sipping iced coffee and hot tea. 12:30 p.m. Cullen wakes up. Craig had come home during this time, so we hang out with dad for a bit before he has to go back to work. Diaper change and then to the kitchen for lunch. 12:45 p.m. Cullen eats lunch, I clean up the kitchen, and finalize our afternoon hiking plans. 1:05 p.m. 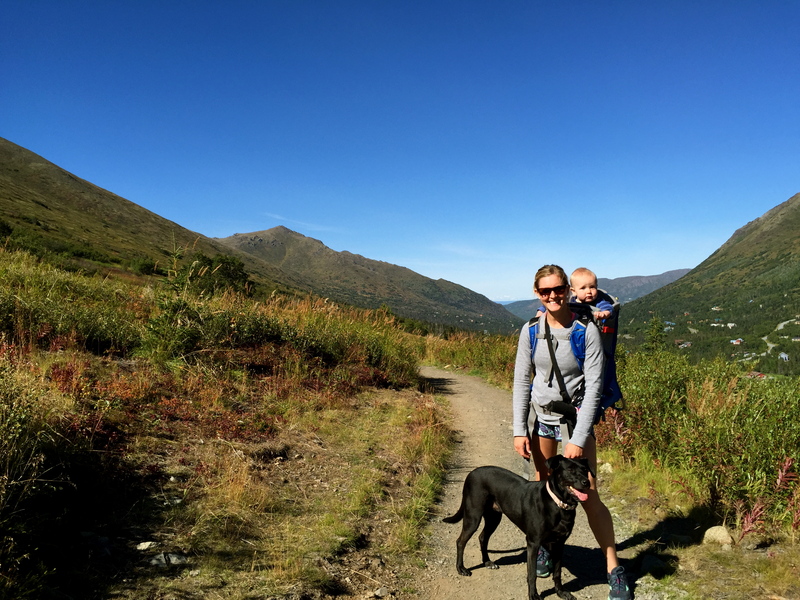 I pack the diaper bag, get our kid carrier hiking pack ready, fill water bottles, find the bear spray, grab an extra layer for myself, get Sadie’s leash. . . . .always so many little things to get ready. 1:25 p.m. The car is finally packed and we head to Eagle River for our hike. 2:10 p.m. I arrive a little late meeting Whitney for the hike. Then another 10 minutes are spent feeding Cullen, getting him in the pack, the bear spray strapped to me, and everything ready for the hike. 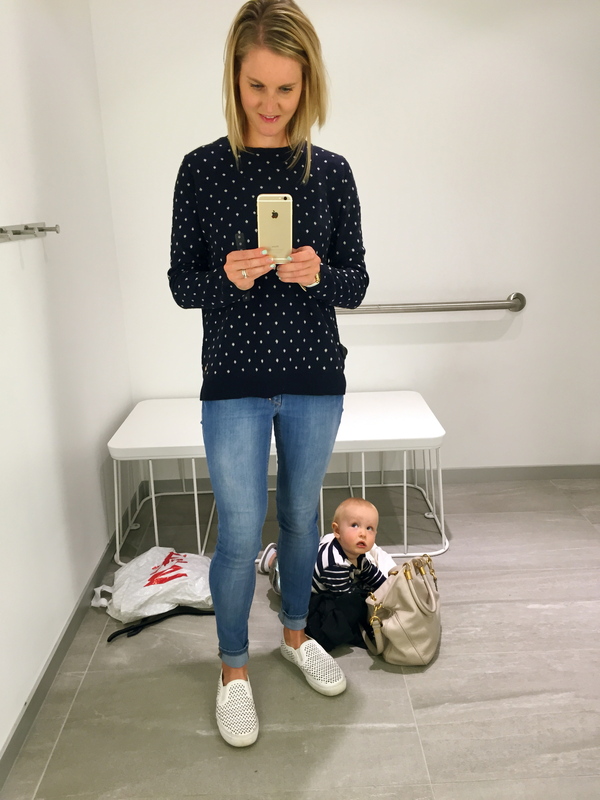 You can’t do things too fast with a baby, but honestly it isn’t that much of a nuisance to me; I’ve am usually pretty good about giving myself ample time these days. 2:20 p.m. We start our hike along South Fork. It is a beautiful sunny day. The mountains are gorgeous and we enjoy chatting with one another. 4:10 p.m. I buy a few staples at Fred Meyer that we are low on at home: fruit, broccoli, cereal, milk, and cheese. 4:30 p.m. My trip to Fred Meyer was two-fold because I had also arranged to meet a lady to buy a pair of Hunter boots from her that she had posted on Craigslist. 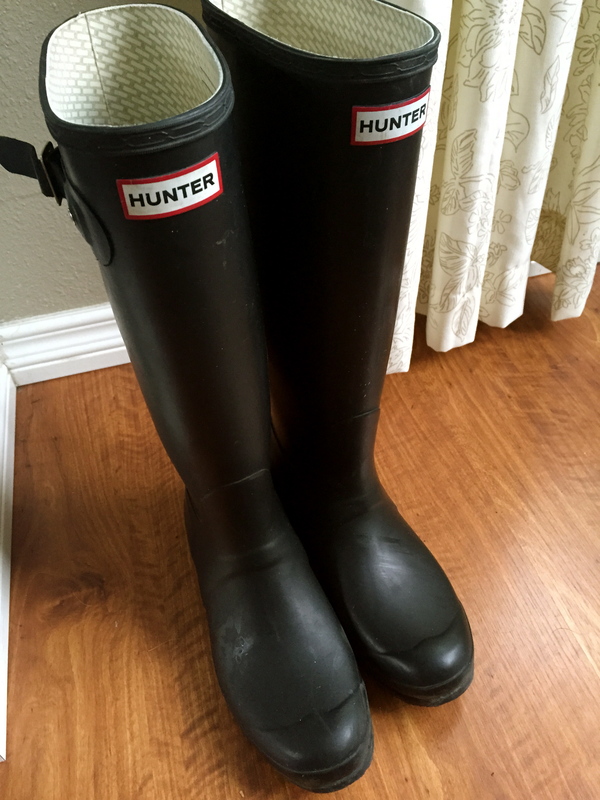 I have been scouring Ebay for several months looking for a pair, but they always went for $100 – $125, so I checked Craigslist and was shocked to find a pair in my size, a color that I actually liked, and not too ridiculous of a price ($75). 5:10 p.m. We arrive back home. Craig is home already, so I get started on dinner. 6:15 p.m. This wasn’t necessarily a complicated meal, but it always takes me longer to make food than it should. I don’t know how people can actually cook something in less than 30 minutes. 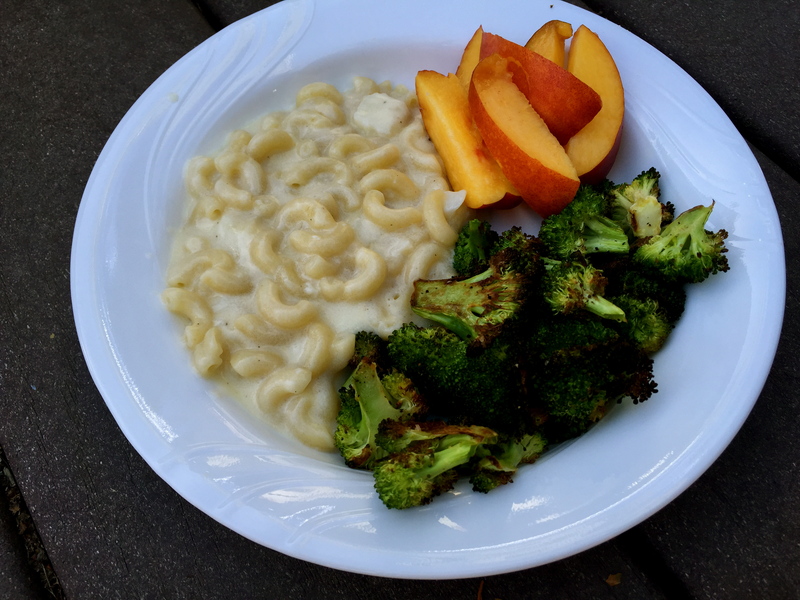 Dinner was (Mock) Lobster Mac ‘n’ Cheese, roasted broccoli, and nectarine slices. 6:45 p.m. I clean up the kitchen while Craig plays with Cullen. 7:15 p.m. Craig takes Cullen with him to the dog park. I get ready to go running. I run for a little over 20 minutes. Running felt foreign to my legs, but it was still nice to get out there. 7:50 p.m. Return from my run and work on this blog post. 8:30 p.m. Craig and Cullen return from the dog park. Our friends stop by so we chat with them for a bit. 8:45 p.m. Time to start Cullen’s bedtime routine: bath, pajamas on, brush teeth, read books. Cullen doesn’t fall asleep (go figure! ), so he plays while I pick up the living room and have a snack (cereal). 9:50 p.m. We try again to get him to sleep and thankfully this time it works. 10:10 p.m. I get ready for bed and finish this blog post. 11:00 p.m. Lights out for me. You just finished reading Quinnipiac poll of FL,OH,PA: fortunes of Walker and Clinton sink as Biden’s rise! Consider leaving a comment! Happy Friday! I hope your week was a good one and you have fun plans for the weekend. I am working at the store (Skinny Raven Sports) this weekend, but I can hardly call it work. 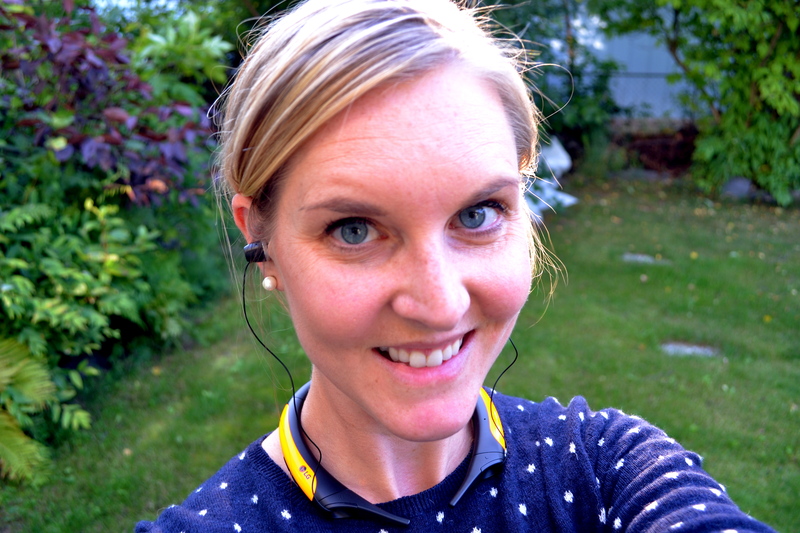 I don’t have to sit at a desk, I get to talk to and interact with all sorts of different people, and help people finding running shoes and accessories. Saturday morning I am also coaching the Raven Run Club training group through Skinny Raven. I have wanted to help coach the training groups for a while, and I’m glad it has finally worked out for me to do so! Photo from our 6 a.m. Wednesday training group this past week. What a great group of people, and it is so cool to see people of all abilities out there trying to better themselves. It dawned on me that today marks 8 years in Alaska! Craig and I drove up from Minnesota August 2007 in 3.5 days logging 15 – 17 hours of driving most days. It feels like forever ago we did that, and I didn’t think we would be here past a year, but 8 years later. . . . . I get weekly e-mails asking me about moving to Alaska. While it is hard for me to say whether or not Alaska is right for you, here are some posts I’ve written about living in Alaska. The transition for me living here hasn’t always been easy, but I have done my best to accept it for what it is. Should I Move to Alaska? And now for a few random photos and highlights I haven’t shared with you guys. After the marathon on Sunday, we went over to our friend’s place to play a bunch of random, silly games. 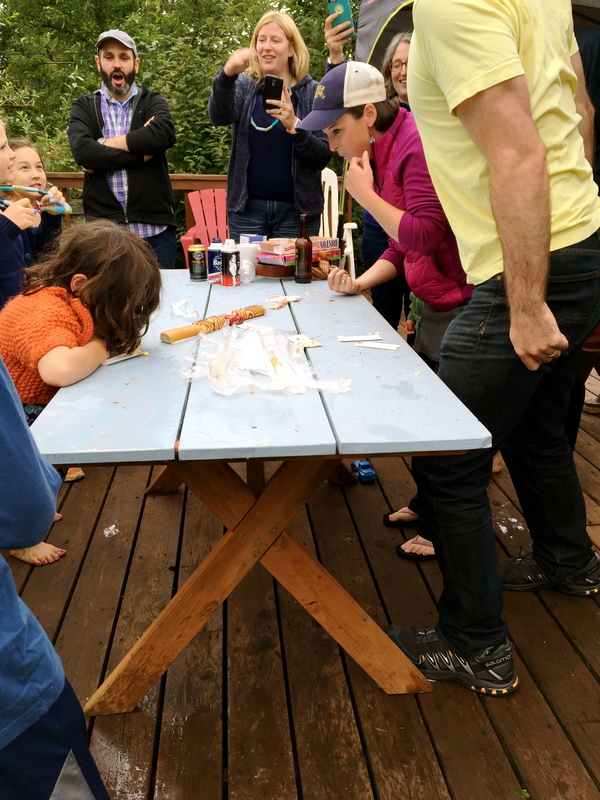 (Similar games like on Minute to Win It.) Cullen and I hung out most of the time because I was in too much pain to do much of anything. Craig participated in a strawberry cream roll eating contest. Craig has been tending our garden this year. (I attempted last year and failed miserably.) He loves kale and decided to plant about 20 plants. 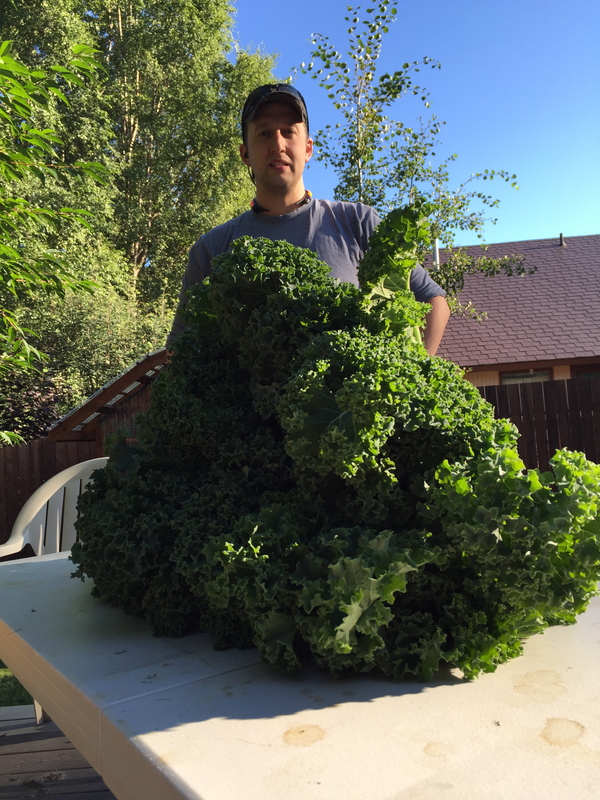 Let’s just say I don’t think he realized how much kale he would reap. He’s been freezing the extras, which is perfect for smoothies such as this one. We have been making all sorts of awesome meals lately. I made these Spicy Sweet Potato Black Bean Burgers, and they actually stayed together when I was cooking them and when we ate them. 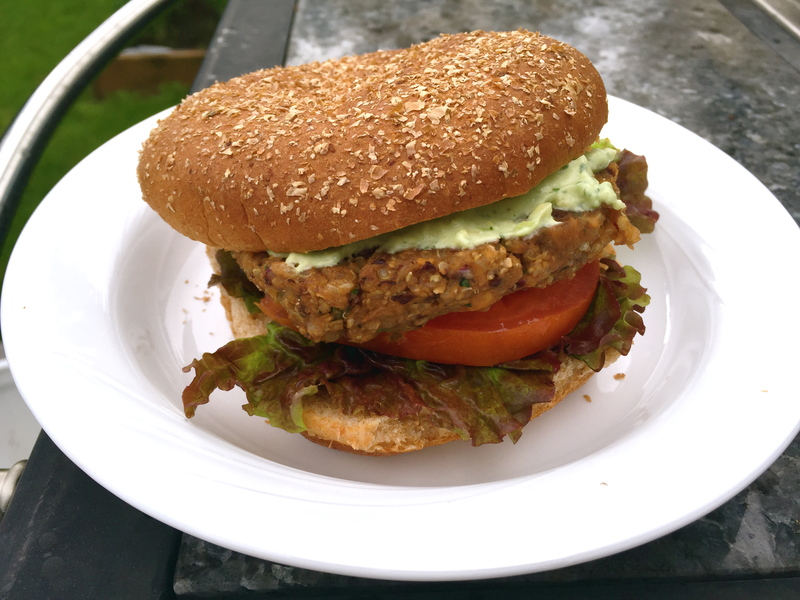 I have tried a lot of vegetarian burger recipes before and most of them crumble when I try to cook them. The avocado crema sauce was a great addition. Even Cullen loved them. 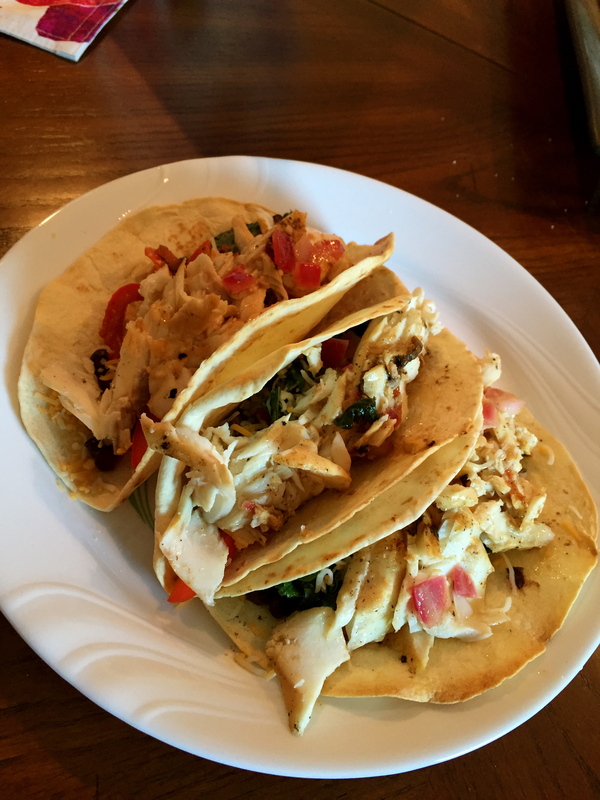 Craig made blackened halibut tacos a couple times for dinner, which were fabulous. Of all the types of fish, halibut is definitely a favorite of mine. Oh, and P.S., if you are looking for something to do this weekend in Anchorage, check out the Greek Festival going on at our church today through Sunday. Baklava, gyros, live music, dancing. . . . .and many “opa’s”are sure to be heard! You just finished reading Marquette U. Poll of Wisconsinites: 39% approve of job Walker is doing as Guv, 57% disapprove! Consider leaving a comment! And what a day it was. . . .a mistake in the placement of a turn-around on the course left almost everyone running a mile short on the marathon course. At first it appeared I had run a sub-3 hour marathon and set the course record, but I knew as I crossed the finish line that that wasn’t correct. Let’s start at the beginning because I’m type-A like that. . . . .
That’s me in the hot pink top. I spent the week prior preparing for the marathon. 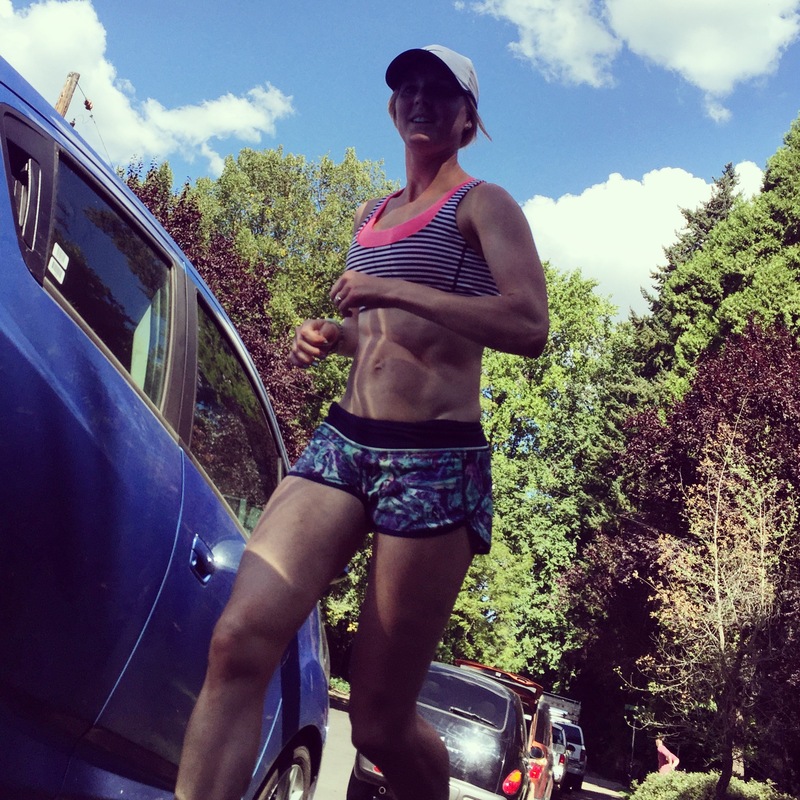 It was my ‘A’ race of the summer, and all my training thus far was helping me prepare for this marathon. I laid low at home nearly every day, trying to stay off my feet as much as possible, foam rolling and stretching while I played with Cullen, eating clean, listing to a pod cast to help me visualize a strong performance, and think of positive mantras or lines I was going to say when the negative thoughts crept in. My secret time goal my coach and I discussed before the day was a sub-3:05. 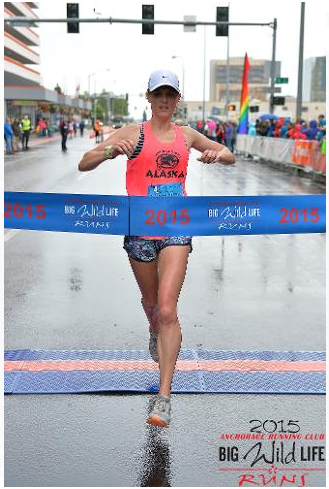 She said she thought I was capable of finishing somewhere between 3:04 – 3:07, and she said why not go for sub-3:05. Prior to talking to her, I was thinking a sub-3:10 was a good goal, but that’s me being a safe better. 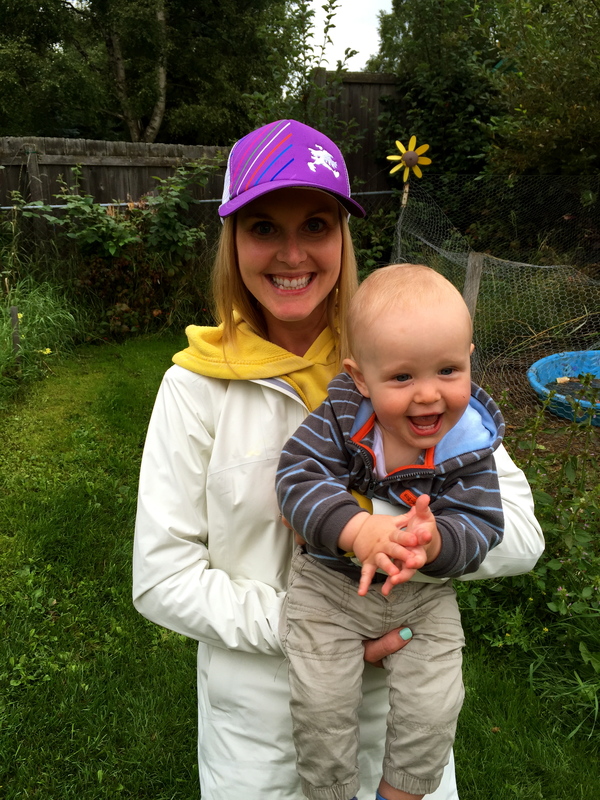 This is what I love about having a coach–she pushes the boundary and sets the bar high! The morning of the race I woke up, got ready, ate breakfast #1 and #2, and made sure Cullen was ready to go by 8 a.m. Craig drove me downtown to the start and took Cullen in the backpack for the morning. I did a short warm-up and some stretching before getting to the start line. When the gun went off, I was ready! I felt energized and ready to tackle 26.2 miles. So with the time goal of sub-3:05, that put me at an average pace of 7:03 minutes per mile. 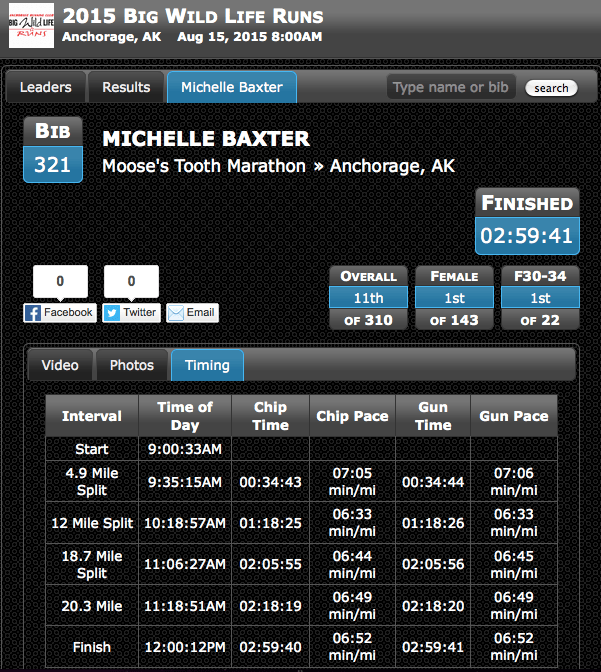 My goal was to start 10 – 15 seconds slower than my goal pace and then work into my goal pace by mile 3. Well, I’m blaming the downhills at the beginning for my mile being 6:53. Oops! I swear it felt easy-peasy. I tried not to look at my watch and just go by feel, but it was hard though because I didn’t want to go too slow. 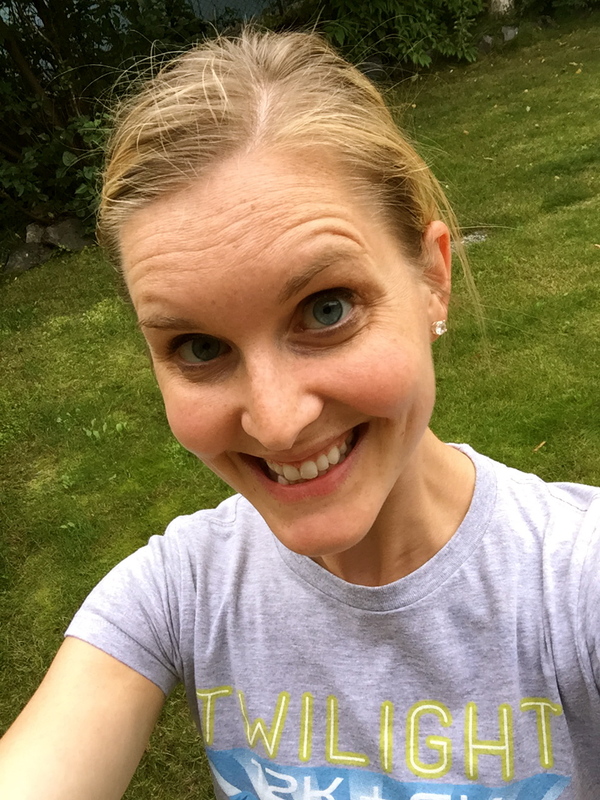 I tried to focus on running the tangents, my legs feeling like a well-oiled machine, and giving myself landmarks to focus on getting to: Craig waiting and cheering for me, the turn-around, downhill portions, etc. I felt strong during the first quarter of the marathon. I took my first energy gel at 45 minutes and continued to tick off the miles. Even before we got to the incorrectly placed turn-around, the mile markers were quite off. Some were too early, others too late. I know my GPS doesn’t always pick up a great signal on the trails because they are shaded with trees, but they seemed more off than usual. When I got to the turn-around, I didn’t realized it was too soon. I had looked at the course map, but I didn’t remember specifically what the mileage was supposed to be at the turn-around. However, within a few miles I knew something wasn’t right. You can see how my splits drastically changed signifying something was off. As the race progressed, the mile markers still confused me, and I kept looking at my watch trying to figure out what was going on. I don’t think it affected my performance, but it sure was confusing. I was able to pick up a pace during the last 6 miles a little more, but those last two miles were rough! I was so ready to be done. There was one last hill about 0.5 mile toward the end that I was dreading, but I managed to pick up my feet the best I could and make it to the top. Once I was at the top of that hill, I knew I didn’t have much farther to go. As I turned onto the home stretch, past all the crowds of people, they announced that I was the first women’s marathoner and everyone started clapping and cheering. Oh wow, was that exhilarating!! I gave it my all and broke the finish line, which was pretty cool I have to say. I immediately looked for Craig, who I knew thought I was actually sub-3 hours. “The course was a mile short,” I told him. I talked to a couple of other guys who finished in front of me, and they too confirmed that the course was short. I did a quick interview with the local news station (That was something new for me too!) before congratulating the second place women and talking to friends who had come to cheer for me. I also talked to a news reporter from Alaska Dispatch News for her write-up. And then the life of a mom called as Cullen realized he was hungry when he saw me. I snuck away to a place inside since I was shivering by now so I could feed him. That’s one job that doesn’t stop. I know people are livid about the course being the incorrect distance, but I feel awful for the race director (who I’ve interacted with in the past and have nothing but positive things to say about) and the course officials. I hope people realize it was an honest mistake and it has happened at other races as well. It sounds like people will still be able to qualify for Boston, and I most likely will not hold the course record, which I am definitely okay with because I honestly don’t feel I deserve it. All in all, I am still so happy to have run so well, and I know (KNOW) I will be able to cinch that sub-3:00 marathon next summer! My summer travels have now ended, and it is back to reality. 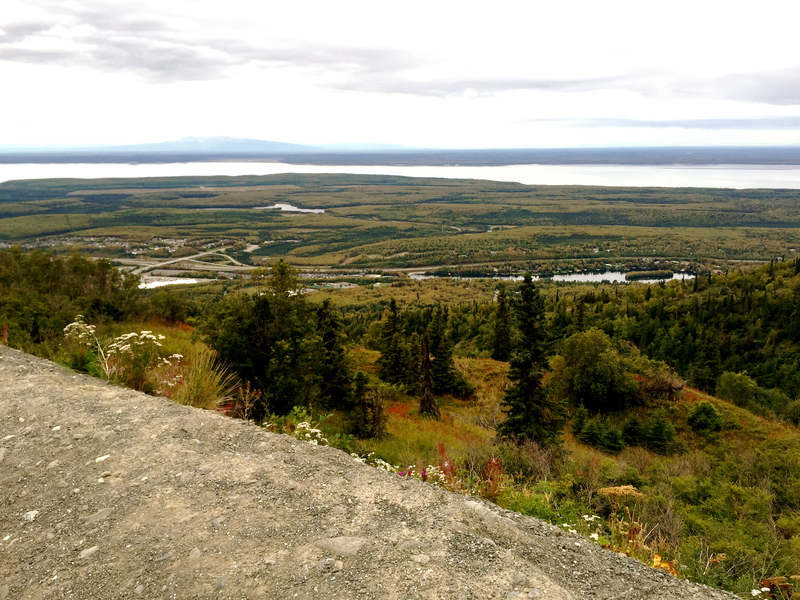 I feel like I hardly spent any time in Anchorage this summer as I’ve been traveling on-and-off for the past 7 weeks. Cullen flew on 7 planes and logged more frequent flyer miles than most people do in a year. He was a great little traveler. 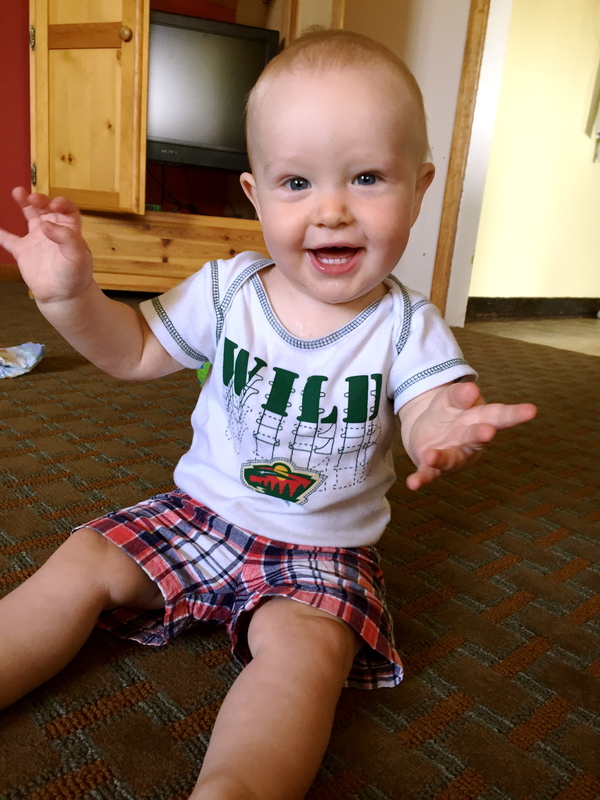 I first spent two weeks in Minnesota visiting my family so Grandpa and Grandma could see Cullen. We were then home for a week before we boarded a plan to Cordova, AK for six days where I learned about Copper River salmon during a blogger trip. 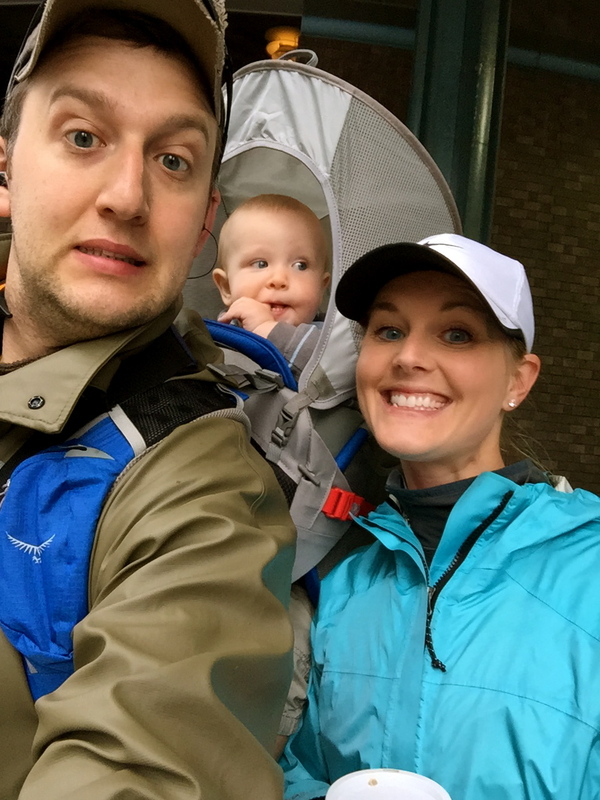 After a week to unpack and repack again, the three of us were off to Oregon for two weeks for our family vacation. 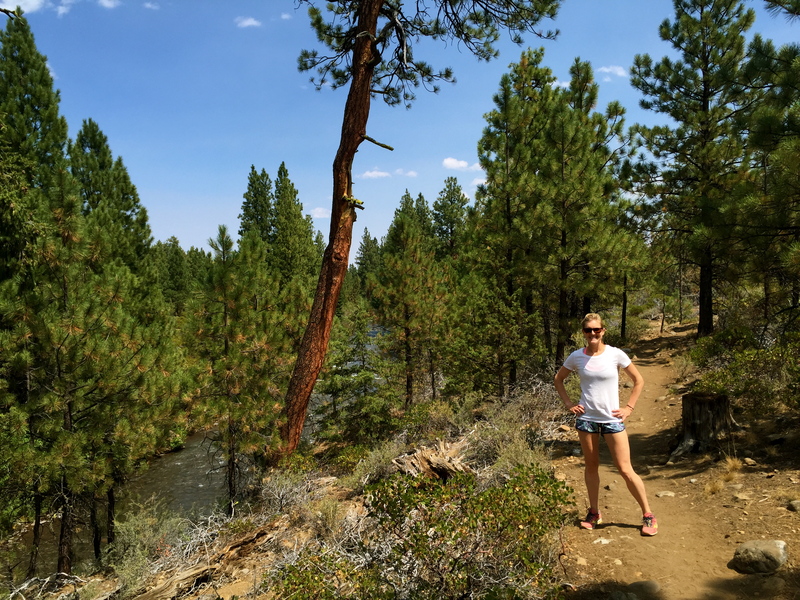 While in Oregon my brother-in-law got married, we hiked in central Oregon, dined in Portland, visited friends, and I had my first experience running at altitude. Here’s a very quick recap on our time in Oregon. 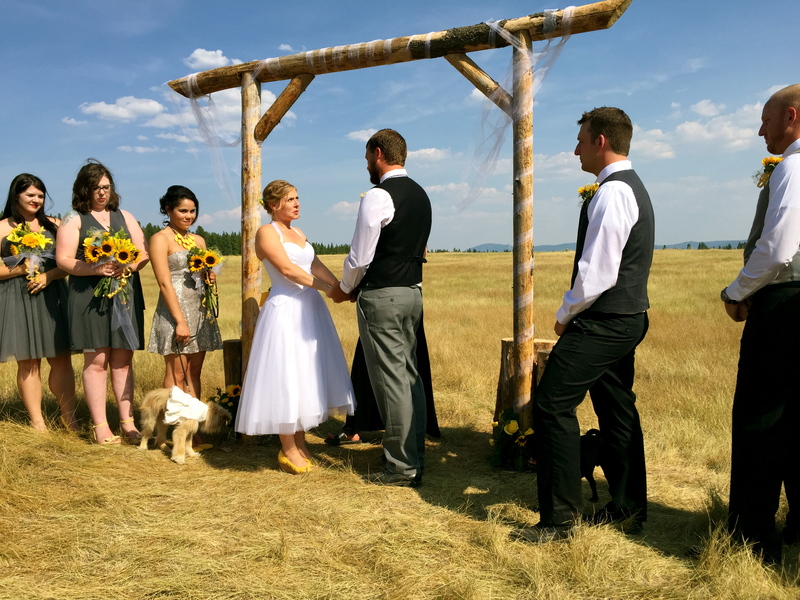 Matt and Amanda had a beautiful outdoor wedding in Sumpter, OR–a tiny town of 200 people. I think there were more mule deer than there were people. They were everywhere in the town and very docile. 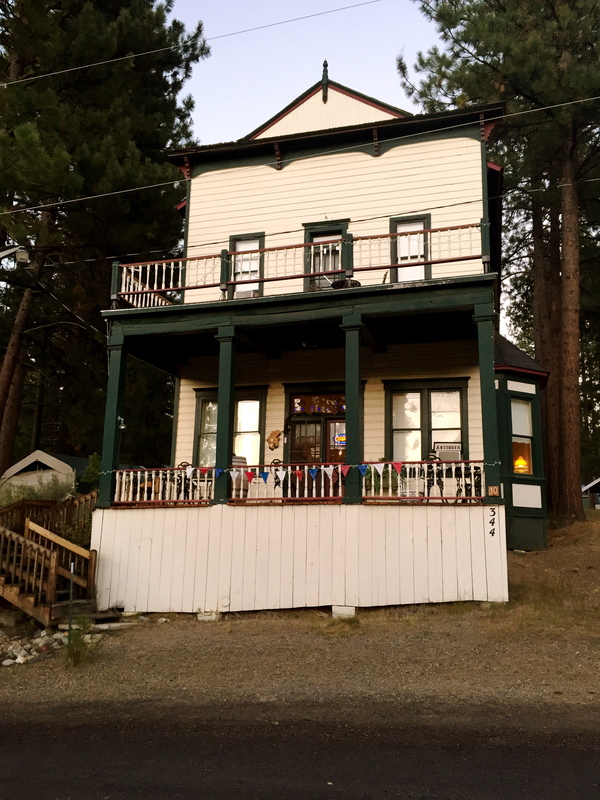 We stayed at the Sumpter Bed and Breakfast, which used to be the hospital. The hospitality was second-to-none. The owners fed us when all of the other restaurants in town closed at 7 p.m., they did Cullen’s laundry, and went above and beyond to make our stay very enjoyable. After the wedding, Craig, Cullen, and I headed to Central Oregon. We stopped at various places on our drive there including a U-pick farm. I was so excited to score three pounds of peaches, plums, and nectarines for a mere $2.50. 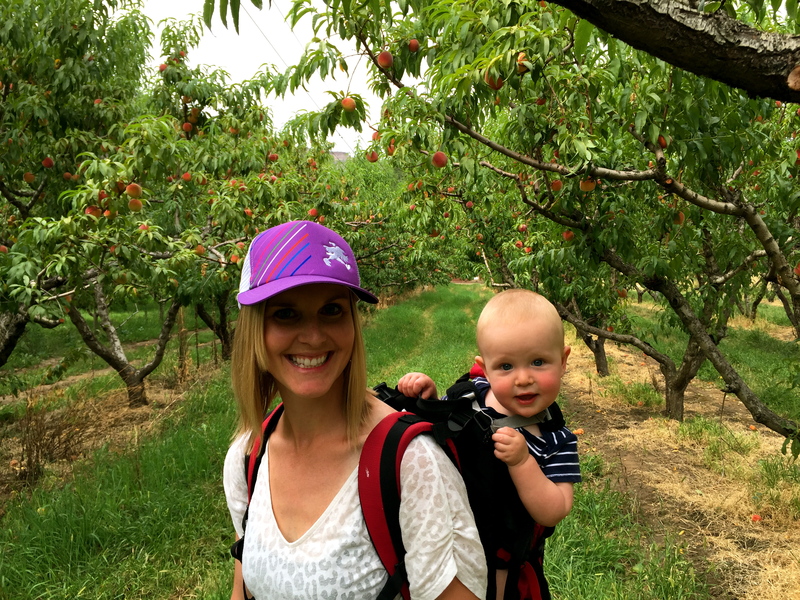 Cullen had fun riding in the backpack while we picked fruit. 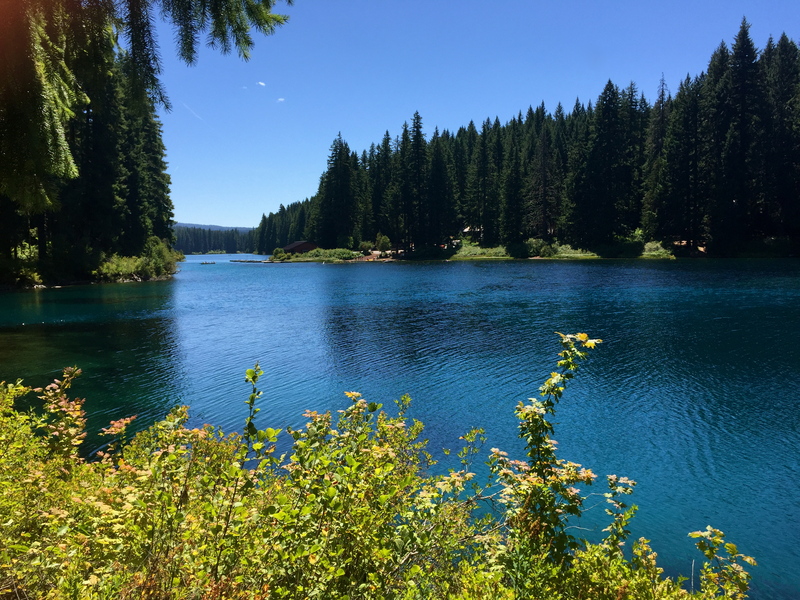 We stayed in Sisters, OR for three days and went on two hikes. The first one was along a river. 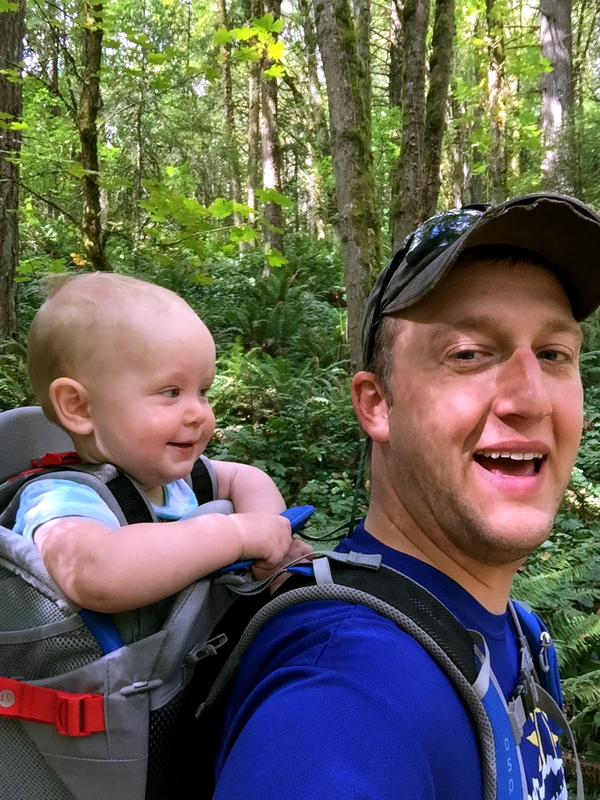 We weren’t able to hike too long because Cullen got pretty fussy, but it was a beautiful summer day to be outside hiking. The last weekend of our trip we dined on all sorts of food in Portland: Salt and Straw, New Seasons, Waffle Window, and Cup and Saucer. Everything was so good, and we didn’t even make it to all of our favorite places. 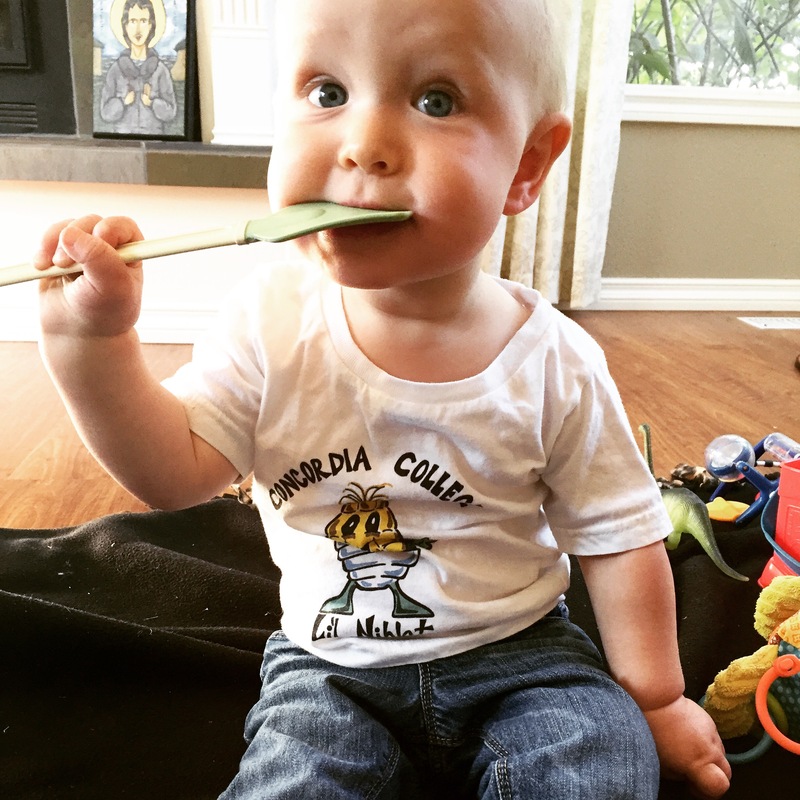 Cullen has really gotten into eating solid foods and loves everything we give him. 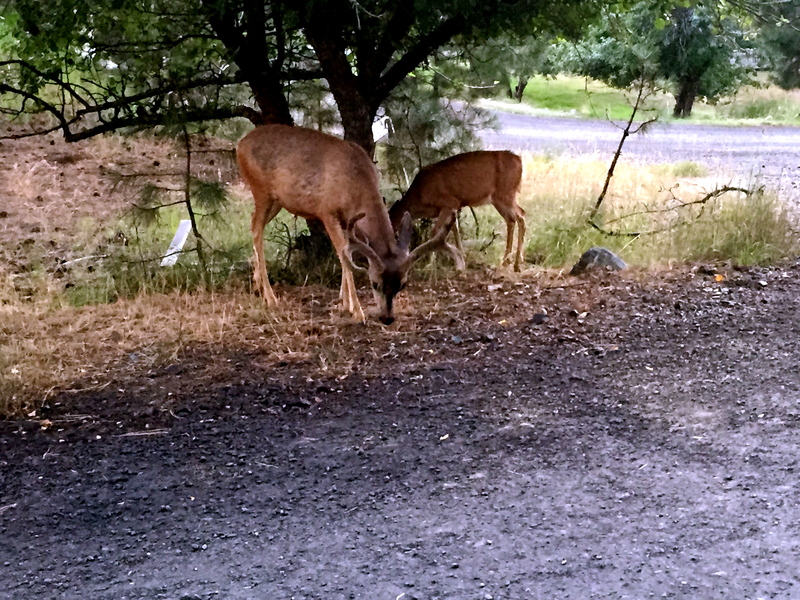 One morning I met a friend to run the trails of Forest Park in Portland. It was nice to change things up, but the stabilizer muscles in my hips were a little sore the next morning. Craig and Cullen went on their own hike while I ran. 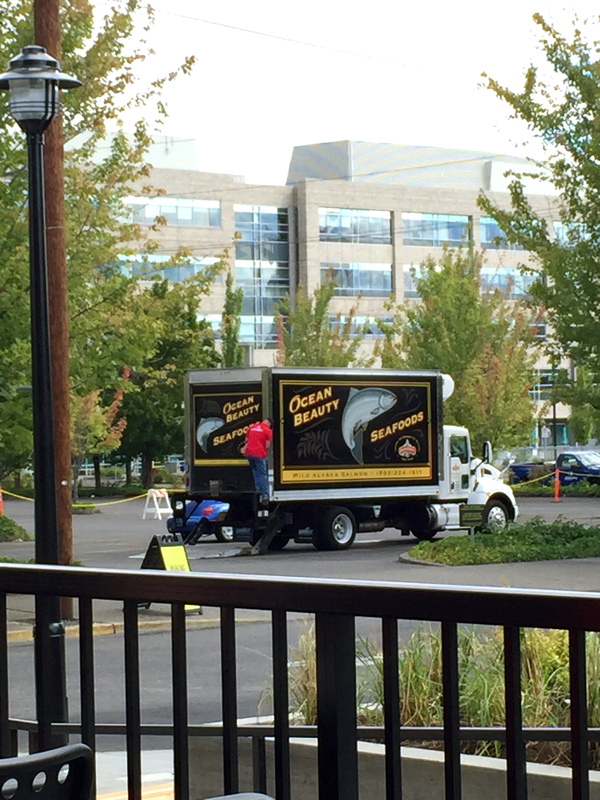 I also saw this Ocean Beauty truck while in Portland. This is the fish processing plant I toured while in Cordova, Alaska learning about Copper River Salmon. Be sure to follow me on Instagram. I shared a lot more photos from our trip there, so be sure to check them out. With all of these adventures, I’ve hardly had time to think about the marathon I am running on SUNDAY! This week has been all about resting, relaxing, and visualizing a strong performance. I am hoping for big things on Sunday. I’ve had a pretty phenomenal summer of racing–setting PRs in the 5 miler, 10K, 12K, and half-marathon. I did not, DID NOT expect to set PRs this summer at all! And some of these PRs were pretty big: 4 minutes in the 12K and 2.5 minutes in the half. Right now my PR for the marathon currently stands at 3:17. I know I can beat this time on Sunday, but I am hoping for something much bigger. There’s a number in my head, a time goal that my coach says I can run. We’ve discussed what I am capable of, and while I am still scared, I believe in the training I’ve done and trust her opinon. She’s been spot on in predicting my finish time for my other races (And I’ve actually run a couple faster than what she predicted. ), so I know she isn’t leading my astray. Earlier this summer I admitted my ultimate running goal is a sub-3:00 marathon. It still seems unfathomable, but if this marathon on Sunday goes as well as I hope it does, I KNOW I can run a sub-3:00 marathon one day (hopefully next summer). 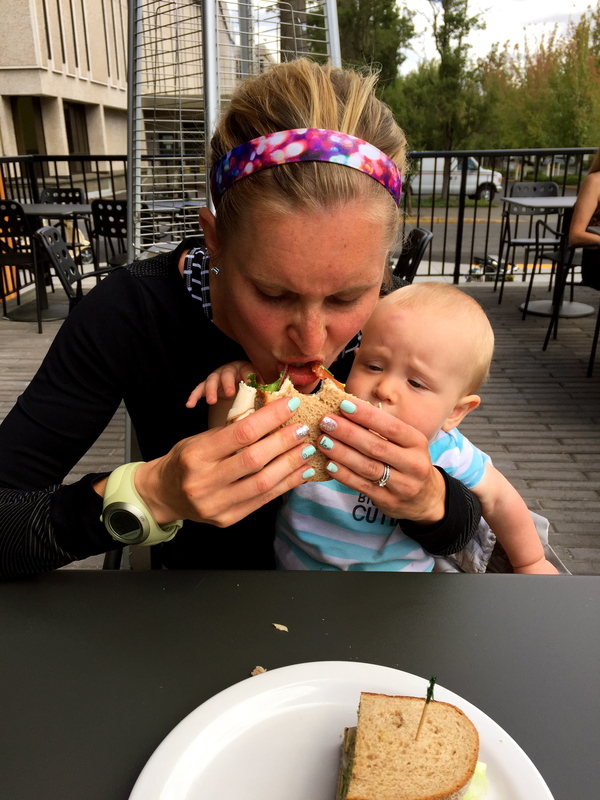 I don’t expect to run a sub-3:00 marathon on Sunday, but I do plan to run my little heart out.